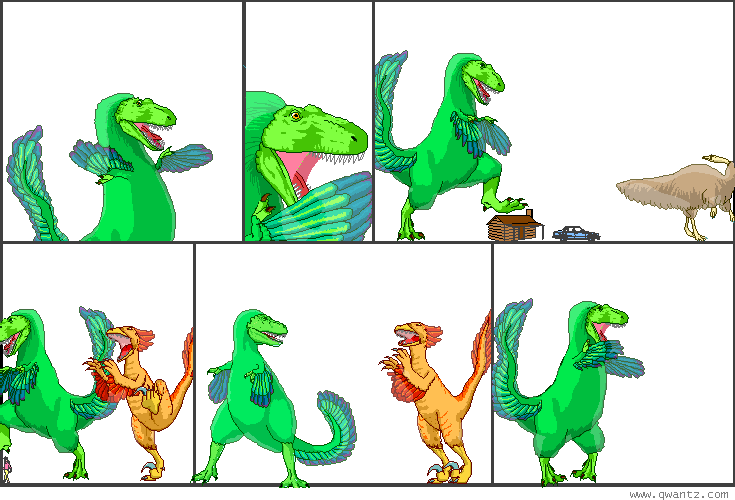 Dinosaur Comics - February 4th, 2011 - awesome fun times! February 4th, 2011: I am back from my visit to the States! I stayed with Richard "Diesel Sweeties" Stevens and we discovered that we're pretty much the same person, with the same tastes in food AND music AND books. Is there anything else that defines a human being? There is: hair colour; that is where Rich and I sadly part ways. One year ago today: i had to stop with the north american city names because so many are taken from native words, which were usually descriptive! IT WAS CHEATING. but then tons of european cities have obscure contested origins, and i already did batmania, australia!